* FDR was an elitist who influenced public policy in order to benefit special interests, including his own. * FDR and his Wall Street colleagues were ‘corporate socialists’, who believed in making society work for their own benefit. * FDR believed in business but not free market economics. Sutton describes the genesis of ‘corporate socialism’ - acquiring monopolies by means of political influence - which he characterises as ‘making society work for the few’. He traces the historical links of the Delano and Roosevelt families to Wall Street, as well as FDR’s own political networks developed during his early career as a financial speculator and bond dealer. The New Deal almost destroyed free enterprise in America, but didn’t adversely affect FDR’s circle of old friends ensconced in select financial institutions and federal regulatory agencies. Together with their corporate allies, this elite group profited from the decrees and programmes generated by their old pal in the White House, whilst thousands of small businesses suffered and millions were unemployed. 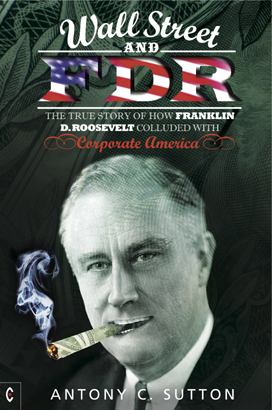 Wall Street and FDR is much more than a fascinating historical and political study. Many contemporary parallels can be drawn to Sutton’s powerful presentation given the recent banking crises and worldwide governments’ bolstering of private institutions via the public purse.